I am looking for a jack that I can keep in the trunk of my Solstice and is low enough to be used to jack the car on one "corner" in case I have a flat. Any other suggestions . . . . . . ? My car is lowered, so this works for me with a lifting puck (or hockey puck). I would recommend a cheap ratcheting breaker bar with a couple of deep socket. One for the end of the scissor jack and one for your lug nuts and wheel lock key (if you have one). This jack is small enough to haul around. But my question is why? You don’t have a spare tire? I do have a spare wheel + tire. But without a jack it is kind of useless. Also when on the road the jack enables me to remove the wheel, get it fixed or pick up my spare, install the wheel, continue my journey. I think it was @rob the elder that found a nearly flat aluminium jack that is really cool (albeit quite expensive). Can't remember where it was posted, but hopefully he'll chime in. I think that that style of jack is going to be the most practical for what you want to do. If you really want to spend a lot more money you can, but why? Now that I think about your reasoning I will be carrying mine, along with a torque wrench and socket. I already carry a plug kit, pliers, and a small inflator, but taking the wheel off will make it a lot easier to work on if I ever have to. You may be less "not smart enough" than you thought. Wspohn posted about the billet jack, but the link to it that he posted isn't live anymore. This is the new URL - https://www.calcarcover.com/product/...minum-jack/705 for the Billet jack. VERY nice tool. But I do not want to spend that kind of money. There's also the inflatable kind that uses the exhaust of the car too inflate, but I haven't priced compared the two. Last edited by ChopTop; 02-16-2019 at 10:46 AM. I carry a tire repair kit - plugs and tool plus the OEM inflator. I keep my spare tire at home. In case of a flat, call wife, she brings spare to me. Her car has a lug wrench that fits the GXP and her Jack is a low scissors type that will fit under my car. Didn't think of carrying a Jack and wrench to remove tire to facilitate tire repair. But............. I have not had a flat in any car in over 10 years. Only slow leaks. Never had a flat either...... But 2 weeks ago I noticed that while hibernating TheRedOne has a flat. So got a compressor to check how fast it goes down and a new tire on spare rim. Gonna change it tomorrow using jack from my daily driver. Then take wheel to dealer to get tire/rim repaired or replaced. Last edited by RedOne07; 02-16-2019 at 11:05 AM. I have had one flat, in one of the Skys, after a combined 125k miles of driving them. I got it plugged OK and didn't think too much about it, but doing it on the car was a big enough pain that the jack and wrench will be worth it for out of town trips. The puzzling thing to me is why it has just now made that much sense. its a billet fold flat jack that they have made and the only place I found it was on their site. I have jacked the wheels off the ground, it will do one wheel at a time because its range of motion is limited by its size. A block of wood will make it easier. I have the same jack From California Car Cover, on my car I had to add a 1"X4" block of wood under it to actually lift a rear wheel off the ground. But it does the job. I like it as we usually take our car on at least 1 5-7 day trip and I wanted to have a way to remove a tire for inspection/plugging if needed. In 57 years of driving I've only had 1 instance where a tire inflator would not have been enough to get me to a tire shop. I do, however, carry a plug kit in my SKY, which I have never used (I've put 51000 miles on the SKY with no tire problems). I still have the jack from a '59 Renault. 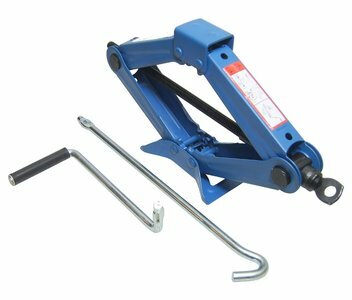 Nice scissor jack, small, heavy duty, and fits over the pinch weld (or not). I still carry it in my trailer. It will lift a loaded axle. You should be able to find something at a salvage yard.